Please note that we anticipate to have a very tight schedule. Therefore, due to the complexity of organizing an event of this magnitude, we cannot accommodate requests for specific days or times for presentations. Please, also share this notice with any co-presenters. If you haven’t done it yet, we urge you to confirm your assistance to this event on or before February 15, 2017, by sending a note to congreso.educacion@upr.edu AND by completing the online Registration form at the conference’s website at http://congresoeducacion.uprrp.edu/ or direct access from http://bit.ly/2jVXIAI. It is important that all presenters register before the given date. If you do not confirm your participation, we will have no way of knowing if you are actually attending this event, and therefore we will have to exclude your presentation from the Program. If you have already confirmed your attendance, you don’t need to send an email again, but remember to register online, if you haven’t done so yet. Each room assigned for the panel sessions will be equipped with a Windows PC and Microsoft Office 2007 or 2010, a multimedia projector and a projection screen. Please, bring your PowerPoint presentation on a USB drive, and send a copy to your email as backup. If your presentation is designed on a Macintosh computer, make sure the electronic file is fully compatible with Windows, or bring your own computer. In the latter case, you will also need to bring the proper adapter to connect your Mac computer to the projector: (a) if you need Internet access, bring a USB/Ethernet adapter, (b) for multimedia projector, bring a VGA adapter, (c) or any other adapter you may deem necessary. 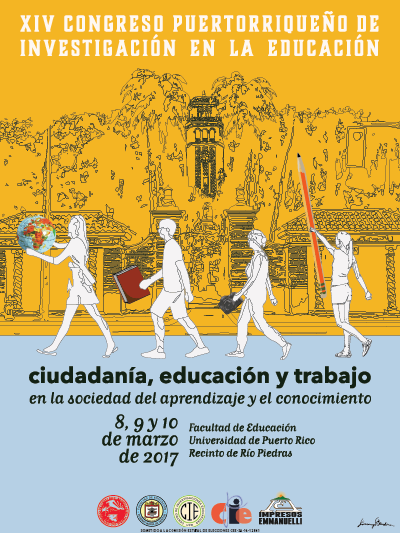 All activities of the XIV Puerto Rican Congress on Research in Education will be held on the College of Education of the University of Puerto Rico, Rio Piedras Campus. The meeting place will be Amphitheater #1 of said faculty. The Rio Piedras Campus of the University of Puerto Rico is located in the capital city of San Juan, Ponce de Leon Avenue, Rio Piedras. Use the following Google Maps link to see the precise location on the map. In this second map, the College of Education building and Amphitheater #1 correspond to number 37 (Facultad de Educación Eugenio María de Hostos). The University of Puerto Rico does not have hotel accommodations on its grounds, so we suggest you check out the hotels in the tourist areas of Condado, Isla Verde, Miramar and Old San Juan. Transportation from these areas to the UPR should average about 20 minutes of commute time by traditional taxi. You can also contact UBER service for your transportation needs. As another option, you can combine buses and urban train (Tren Urbano), although this method will take longer (up to an hour of commute time) depending on the nearest bus station to your hotel area.